Cancer mortality declined by 27 percent over the past 25 years. 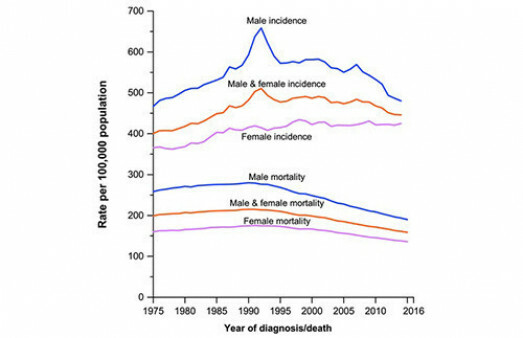 The rate of cancer-related death has fallen substantially over the past quarter century, with much of the decline attributable to a reduction in smoking and improvements in early detection and treatment, according to the latest annual report from the American Cancer Society (ACS). Despite this progress, however, cancer remains the second leading cause of death for men and women in the United States. As described in the ACS journal CA: A Cancer Journal for Clinicians, each year the organization collects the most recent data on cancer incidence (new cases), mortality and survival. Incidence data, available through 2015, comes from the national Surveillance, Epidemiology and End Results (SEER) program and other sources, while mortality data, available through 2016, were collected by the National Center for Health Statistics. The ACS authors estimate that 1,762,450 people will develop cancer in 2019. Over the past decade, cancer incidence was stable among women and declined by about 2 percent per year among men. But still, more than one in three people are expected to be diagnosed with cancer in their lifetime. Data from the annual report are further described in the companion report, Cancer Facts and Figures 2019. This year’s report features a special section on cancer among people age 85 or older. The so-called oldest old account for 8 percent of all newly diagnosed cancers and 17 percent of cancer-related deaths. The number of people in this are group is expected to nearly triple, reaching 19 million by 2060. The most common cancers among men are prostate cancer, lung cancer and colon cancer, which together account for 42 percent of all cases. The most common cancers among women are breast cancer, lung cancer and colon cancer, together accounting for half of all cases. Liver cancer—associated with hepatitis B and C, heavy alcohol use and fatty liver disease—has the fastest-rising incidence. Nearly 607,000 people will die from cancer in 2019, the report estimates. Between 2007 and 2016, the cancer death rate fell by 1.4 percent per year among men and by 1.8 percent annually among women. From its peak in 1991, cancer mortality rate has dropped continuously, resulting in approximately 2.6 million fewer deaths than would have been expected if death rates had remained stable, the authors calculated. Cancer was responsible for 22 percent of all deaths in 2016, second only to heart disease. Lung cancer, which is often detected late and is difficult to treat, was the leading cause of cancer-related mortality—more than breast and prostate cancer combined. But lung cancer mortality also showed the greatest decline, falling by 48 percent among men between 1990 and 2016 and by 23 percent among women between 2002 and 2016. Deaths due to breast cancer, prostate cancer and colon cancer have fallen substantially, in part because of widespread screening, but the optimal level of screening to balance early detection and over-diagnosis remains controversial. The report shows that some groups continue to be more heavily affected than others. The cancer death rate was 14 percent higher among African Americans compared with whites in 2016, but this was a drop from the 33 percent gap in 1993. Although racial/ethnic disparities have slowly narrowed, socioeconomic gaps are widening, especially for cancers that are highly preventable, the report says. Low-income people are more likely to smoke and to be obese, both of which raise cancer risk. They are also less likely to receive timely screening, diagnosis and treatment. As an example, mortality due to cervical cancer—which can be prevented with the HPV vaccine and caught early with regular screening—was twice as high in the most affluent counties compared with the poorest ones, while rates of lung cancer and liver cancer were 40 percent higher among men in poorer counties. Click here to read the full Cancer Statistics, 2019 report. Click here for the companion Cancer Facts and Figures 2019 report.